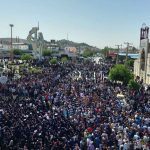 On April 20, protesters in the city of Kazerun took to the streets for the fifth consecutive day. 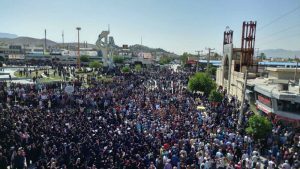 The people of Kazerun are protesting the regime’s plan to split the city into two pieces. Thousands of residents have turned out for days of demonstrations, including many of the city’s youth and a large number of women. Protesters came out for the demonstrations despite the presence of heavily-armed anti-riot forces. In an earlier statement, Kazerun’s Friday Prayers leader said that the regime had decided to pause its plan to divide the city. He and the fake city council went on to order the protesters to disperse and to forbid them from gathering until a final plan is made for the city. Protesters have ignored these words and have continued their demonstrations, demanding that their governor responds to the protests. Residents of Kazerun are opposed to the regime’s plan to split their city, saying that the move is a misguided attempt to resolve problems resulting from years of corruption and mismanagement.